1. 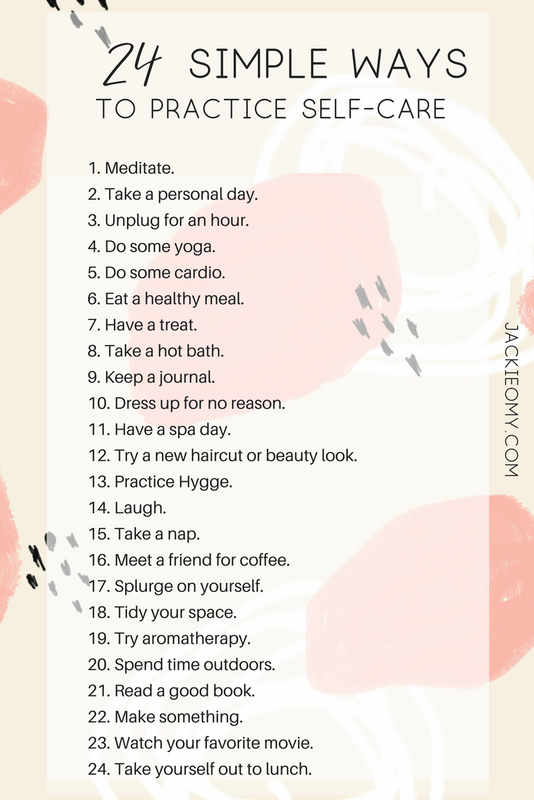 Meditate: Taking a little time out each day can do wonders! Personally, I enjoy using the Headspace app. 2. Take a personal day: Sometimes it's okay to cancel plans to care for yourself. 4. Do some yoga: Sometimes a good stretch is all you need. Don't forget that deep breathing! 5. Get some exercise: Getting your blood pumping has a variety of good effects, including on your mental state. 6. Eat a healthy meal: Just the act of doing something healthy can boost your self-esteem and feelings of well-being. 7. Eat a treat: Of course, it's never a bad idea to indulge in something sweet. 9. Journal: Keeping a gratitude journal is a great mood-booster. 10. Dress up: Put a little extra care into your appearance, just for you. 11. Have a spa day: Pamper yourself at home, or at a spa. 12. Try a new look: Getting a new haircut or trying a new makeup product can help pull you out of a rut. 13: Sit outdoors: Get some fresh air and vitamin D.
14. Read a good book: Why not re-read an old favorite? 15. Try aromatherapy: Light some scented candles! Lavender, Chamomile, and Peppermint are all great choices for de-stressing. 16. Practice Hygge: Find out how to easily incorporate Hygge into your routine here. 17. Laugh: Watch a comedy! 18. Take a nap: Catching up on your rest may be just what you need. 19. Get together for some coffee with a good friend. 20. Splurge: Treat yourself to something you've been wishing for. 21. Tidy your space: Make your room a sanctuary. Spruce it up with some fresh flowers and relaxing candles. 22. Get creative: Try a new DIY and make something you can be proud of. 23. Watch your favorite movie: Whenever I'm down, I watch Jane Eyre or Pride and Prejudice. 24. Take yourself out to tea: Enjoy a nice lunch alone, just you and some peace. Print or pin this list to keep it with you!